Anyone who has taken the trouble to wade through the better ufo reports is soon convinced of the reality of the phenomena. However, any given report can be challenged by the simple expedient of casting doubt on the witness. In this case we have a class one report and a class one witness. As would be expected the lack of reference frames makes for a poor understanding of the objects dimensionality. What is unexpected is that the object is vectoring and that shows unexplained control. I have posted in the past a couple of other class one reports whose detail is so confounding as to have a creditability all their own. Of course, I have also posted in the past that it is likely that a large population is residing in space habitats and has been for millennia. A variety of space adapted creatures have been observed, curiously, who all might have been plausibly been derived from terran stock. Others argue that we are partially derived from alien stock grafted onto primate DNA. Both conjectures assert that we are able to do this and it appears with the first interpretation of the Starchild DNA, that this is not far fetched at all. These are questions that science is now beginning to answer. In a bombshell story, a former SCO of NASA's space shuttle fleet announced that he and NASA know that ETs are real. Clark C. McClelland, a senior member of MUFON from 1958 to 1992, has revealed in the Canadian press that secret details of an amazing incident occurred during the STS-80 mission aboard the space shuttle Columbia. Top space officials rushed to hush it up. According to internal reports—confirmed by Dr. Story Musgrave, a Payload Specialist crew member aboard the STS-80 Mission—a disc-shaped object much larger than the orbiting American spacecraft suddenly appeared beneath the shuttle. At the time the Columbia was maintaining an altitude 190 nautical miles above Earth. Musgrave admitted that, although he got a good look at it, he wasn't able to identify the object. "I don't know what it is. Whether it's a washer, debris, ice particles, I don't know. But it's characteristic of the thousands of things which I've seen. What is not so characteristic is it appears to [have] come from nowhere. You would think that if it's facing the dark side or facing a side towards you which is not reflecting the sun, you would think that you would see something there. It's really impressive." After the shuttle returned to Earth, Musgrave was interviewed about the unworldly encounter. 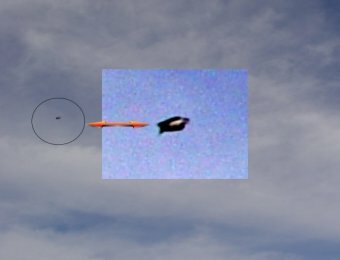 According to the report, the scientist reviewed a video recording of the encounter between Columbia and the UFO as the orbiter flew above Denver, Colorado. The disc-shaped object suddenly appeared, seemed to be intelligently controlled, changed its flight vector and—most unnerving of all—seemed to track the Columbia and her crew through space. After the mission, the space scientist retired from NASA. Convinced that alien intelligence not only exists, but is indeed here, the NASA astronaut has embarked on his own personal mission of disclosure. On a recent speaking tour, he gave a presentation about astronomy. At the end of his lecture, he projected a slide upon a large screen depicting an artist's conception of the infamous "Grey" aliens that have become a part of modern day culture. His final words shocked many in the audience when he proclaimed: "These guys are real…I guarantee it!" Recently former USAF officers revealed at a press conference in Washington, DC that UFOs are real and cited several incidents at two air force bases where UFOs 'took control' of nuclear missiles and changed their launch codes. Historical archives concerning military and intelligence information regarding UFOs has been released by the UK, France, Spain, Brazil and South Africa. Dr. Musgrave is not alone in his assertion that UFOs and RTs are a reality. In past years other NASA personnel have struggled to get the word out. Such space-faring luminaries as Gordon Cooper, Donald Slayton, Gene Cernan, Frank Borman (former chairman of Eastern airlines as well), Neil Armstrong and Scott Carpenter…all insist UFOs are real and alien intelligences exist. This is of course the only way to stop the slaughter. Pretty obviously, a helicopter team can locate animals quickly and remove the horn. There are simply very few animals so a team that simply nails one per day will soon make the whole trade impossible. A year’s work might be sufficient. With rhinos, it can be done easily as shown here. Now the real trick is to remove elephant tusks. Of course, that is not a viable option although there may be good reason to shorten the tusk back down to near the pulp then bind it and protect the result. This is unlikely to stop poaching since most of the tusk will remain. Better would be to sell ownership and management rights and allow an operator to optimize the economic model in a sustainable manner. It still may not be possible but if it worked the managed herds would come under protection. In the meantime, it seems that the method works for rhinos. The roaring chainsaw sends fingernail-like shards flying into the baking Zimbabwean bush as it slices through the slumped black rhino's foot-long horn. A few minutes later, she leaps up and escapes -- disfigured but alive -- in a dramatic attempt to deter the poachers who have unleashed a bloodbath on southern Africa's rhinos. "De-horning reduces the reward for the poacher," said Raoul du Toit of the Lowveld Rhino Trust which operates in Zimbabwe's arid southeast. "Poaching is a balance between reward and risk. It may tip the economic equation in the situation to one where it's not worth the poacher operating." "These poachers in this part of the world here will shoot on sight. They operate in very aggressive units," Du Toit told AFP. "They adopt patrol formations when they are after rhinos to detect any anti-poaching units that are deployed against them and they will open fire without hesitation. "So there've been many gunfights -- a number of poachers killed, not so many on law enforcement side but that's mainly through luck." Zimbabwe's black rhino were poached to a low of 300 in 1995 but recovered and levelled off to nearly double this before plummeting again to reach around 400 last year, according to the World Wildlife Fund (WWF). "It was at this time, 2006-2007, when we actually saw the steep escalation in poaching which is related to syndicate kind of poaching orchestrated out of South Africa," said WWF's African rhino manager Joseph Okari. "It is what makes a big difference between the poaching of today... and the poaching of the '80s and the early '90s," he said. "That was not highly organised and well co-ordinated like what we are seeing today." 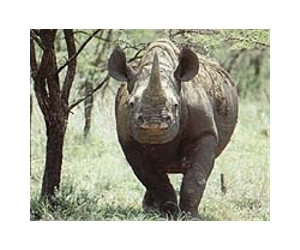 "If it was to continue at this level, we could see our population increase in time," said Lowveld Rhino Trust operations co-ordinator Lovemore Mungwashu. In addition to de-horning, conservationists in Zimbabwe are fitting rhinos with microchips or transmitters to track them, while mounting foot patrols armed in some areas with AK-47 assault rifles. They're also conducting intelligence work to infiltrate the gangs. The Zimbabwe Parks and Wildlife Management Authority -- which has a five-tonne store of severed rhino horns in Harare -- estimates the country now has 400 critically endangered black and 300 less threatened white rhinos. "At peak, we had close to 3,000 rhinos -- that was in the early '80s," said national rhino coordinator Geoffreys Matipano who estimates the horns can fetch up to 20,000 dollars per kilogramme (2.2 pounds). "If you compare it with the past few years, we have managed to contain rhino poaching in the country." "De-horning is not a stand alone strategy. It has got to work with other strategies," said Matipano. For privately run reserves, the fight to protect Zimbabwe's wildlife is relentless. "We've got guys out 24/7 and monitoring things all the time," said Colin Wendham of the Malilangwe reserve near Chiredzi, shortly before a furious rhino mother tried to attack his vehicle. "It's the only way that we're keeping on top of things." "We're dealing with very aggressive criminals," he said as the team ear-notched a young female. "These are not just impoverished local people out to just make a little money -- these are focused professional criminals." This is a stiff reminder of the history of the Palestinian cause. We have forgotten just how poorly populated nineteenth century Palestine actually was. Ancient irrigation systems had been abandoned in the reduction of Judea in the time of the Romans and the resulting collapse was never reversed for almost two thousand years. Jewish immigration began changing all that by the simple expedient of purchasing near waste land and making it productive. Twentieth century scientific agriculture and modernism achieved the rest to produce a presently highly productive land. That was actually never an issue. As mentioned, the resident Arabs welcomed this influx of money and enterprise as the Jewish community was extant throughout the Middle East. The real toxin was the introduction of the anti-Semitic virus brought on and supported by the Nazis which joined with fundamentalist Islam to form a focus for their hatreds and also their ambitions. It has never been removed and it continues to distort ideas and politics throughout the Middle East. Has anyone ever asked why it is even possible for such thinking to exist in Iran? One can understand Medieval Europe and perhaps later the Eastern lands were the community became the commercial servants to the landholders. I have no sense in the historical record that Judaism got treatment different from any other nonbeliever and that Islam depended mostly on economic persuasion to force coercion. That was why the communities survived down through the centuries. Perhaps, we are still fighting the Second World War through a different set of proxies. What has happened in the past half century is that Jews have been forced to leave Arab countries and many other areas, massively increasing the population of Israel and this has progressively changed the facts on the ground. Sheer strength has prevented another outright war of any scale for thirty years outside of incursions aimed at suppressing indiscriminate bombardment. It is in its own way stable while Israel waits for their enemies to sort themselves out. "There were no such thing as Palestinians. When was there an independent Palestinian people with a Palestinian state? It was either southern Syria before the First World War, and then it was a Palestine including Jordan. It was not as though there was a Palestinian people in Palestine considering itself as a Palestinian people and we came and threw them out and took their country away from them. They did not exist. " Israel has lived daily with many 911's, at the hands of terrorist threats within and terrorist threats without and has learned very harsh lessons that America with its one singular 911 terrorist attack is now only beginning to have an inkling of; what is Israel's true attitude about the Palestinians? The false legend of an Arab Palestinian nation is a myth created and marketed worldwide. There is no spoken or written language known as Palestinian, or any Palestinian culture distinct from that of all the Arabs in the Middle East area. There has never been a sovereign land known as Palestine governed by Palestinians. The predominant Arab population in this contested area, in truth, migrated into Israel and Judea and Samaria from the surrounding Arab countries during the past 100 years. They have no historical claim to any property within the State of Israel. When the political rebirth of Israel was accompanied by economic prosperity in the region, Arabs migrated to this contested area to find work and to relish a new higher standard of living. In documents over hundred years old, the area contested and now over populated was always described as a very scarcely populated region. Jews were by far historically the majority living in Jerusalem compared to a very small Arab minority. All of these Palestinians have come from other Arab countries who should now repatriate them. All of the Arab leaders there, including the past so called Chairman of the Palestinian Authority, Arafat , was not a "Palestinian", but was born in Egypt. This is true for all the 'elders'. The famous "Palestinian covenant" states that Palestinians are originally "an integral part of the Arab nations" -- nations with a sparsely populated land mass 660 times the size of tiny Israel (Judea, Samaria and Gaza included). The operative word is "sparse"
Arab sovereignty claims over Israel should be seen for their one real stated intention, the destruction of Israel as a Jewish state, the one and only democracy and true foundation of the Judeo-Christian civilization in the Middle East. Palestinians have no legitimate claims to be even called "Palestinians" let alone have any legitimate claims to any territories within. The Israeli government should in my opinion pack all of them all up lock, stock and barrel and deport them, deposit them in neighboring so-called sympathetic Arab abundant lands. It is true that the Jews' claims to this land are indeed Biblical; that is their clear argument regardless of whether it is legitimized in your mind or in my mind. The Jews were indeed a predominate majority in that contested land, who became "Israelis", as such, only when the United Nations gave them that national identity. These newly nationalized Jews begged their Arabs neighbors who lived there to remain with them and to build a homeland with them. But, the Arab Mufti leaders demanded that all Arabs should leave all their properties and that they should return armed, en masse, to wrest it from the Jews' hands; when these Arabs did this, when they left, they, in the newly defending Israeli's mind set, relinquished all rights to their previous lands. I should expect, in any skewed and stilted comparison of this Middle East conundrum to the European American's horrid treatment of indigenous Native Americans, a suggestion that Israeli Jews give the Palestinian Arabs casino rights. Palestinians are not the only group of Arabs devoted to eliminating the Jewish State of Israel. What Ahmadinajad has said about Israel is that they should be "erased, wiped out, away, from the World's map". Israel has never said that 'Iran should be erased from the map"; Israel did not develop atomic weapons as a stated goal to expunge Iran from the map. Israeli youngsters do not strap toy explosives to their chests the way Palestinian youngsters do, trained by their adults in rehearsal for future suicide bomb attacks. Arabs hate us; do we hate them? "Hate" has nothing to do with Israeli political thinking. To have ANY sense of "peace", we must have a political 'partner', in peace, and the current "Palestinian" 'partner' simply isn't a suitable ' partner'' in any negotiated sense of the word 'peace' as at this point in time their only political desire is the Jews' destruction and the destruction of the Jewish state. Israelis do indeed believe and echo, that only perhaps after several successive generations of 'Palestinians' shall we find that we may indeed have found such a suitable 'partner' required for that Israeli much sought after peace; any other belief in a peace, now, is delusional, given their unqualified murderous intent to our nation. So a fallacy of any argument that Israel does not want peace is that it does not recognize that Israel needs a partner in peace. We used to think of the Communist Russians as our true cultural enemies, but their culture is and always has been much like ours. Russians go to churches(when allowed to ), love making money, have a healthy disrespect for religious fanatics of all ilks, they frequent cafes, believe in evolution, drink alcohol ; especially vodka, they go to operas and party with gorgeous babes. In many ways their culture is not and has never been a threat because they are so very much aligned with what America seeks as "fun". The real cultural enemies of our nation's culture and our nation are the fundamentalist islamics who want to exterminate us as well as our culture and replace it with theirs. Much like the Kamikaze death pilots of WW2, Islamic fundamentalists are unafraid of death within the context of Jihad, in perpetrating their so called cultural superiority. They want to dress our women, like they force their women to, in bee-keeper outfits, to indoctinate free thinking and replace Democracy with mindless rote religion, to kill all infidels who do not subscribe to their religious fanaticism, to eliminate all eating of pork as well as to stop any drinking of alcohol and smoking. This is a real cultural war and illustrates the insanity of embracing any state enforced religion that dictates watching beheading, in a public stadium, as fun on a Saturday night, for crimes of minor infractions of their religious laws. Last month, I went to a villa in a suburb of Berlin called Wannsee. There, on January 20, 1942 , after a hearty meal, senior Nazi officials met and decided how to exterminate the Jewish people. The detailed minutes of that meeting have been preserved by successive German governments. Here is a copy of those minutes, in which the Nazis issued precise instructions on how to carry out the extermination of the Jews. Is this a lie? And what of the Auschwitz survivors whose arms still bear the tattooed numbers branded on them by the Nazis? Are those tattoos a lie? One-third of all Jews perished in the conflagration. Nearly every Jewish family was affected, including my own. My wife's grandparents, her father's two sisters and three brothers, and all the aunts, uncles and cousins were all murdered by the Nazis. Is that also a lie? In 2005, hoping to advance peace, Israel unilaterally withdrew from every inch of Gaza . It dismantled 21 settlements and uprooted over 8,000 Israelis. We didn't get peace. Instead we got an Iranian backed terror base fifty miles from Tel Aviv. Life in Israeli towns and cities next to Gaza became a nightmare. You see, the Hamas rocket attacks not only continued, they increased tenfold. Again, the UN was silent. That was no easy task because the terrorists were firing missiles from homes and schools, using mosques as weapons depots and ferreting explosives in ambulances. Israel , by contrast, tried to minimize casualties by urging Palestinian civilians to vacate the targeted areas. Yet faced with such a clear case of aggressor and victim, who did the UN Human Rights Council decide to condemn? Israel . A democracy legitimately defending itself against terror is morally hanged, drawn and quartered, and given an unfair trial to boot. If this body does not reject this report, it would send a message to terrorists everywhere: Terror pays; if you launch your attacks from densely populated areas, you will win immunity. And in condemning Israel , this body would also deal a mortal blow to peace. Here's why. When Israel left Gaza , many hoped that the missile attacks would stop. Others believed that at the very least, Israel would have international legitimacy to exercise its right of self-defense. What legitimacy? What self-defense? Any time an Arab leader genuinely wanted peace with us, we made peace. We made peace with Egypt led by Anwar Sadat. We made peace with Jordan led by King Hussein. And if the Palestinians truly want peace, I and my government, and the people of Israel , will make peace. But we want a genuine peace, a defensible peace, a permanent peace. In 1947, this body voted to establish two states for two peoples - a Jewish state and an Arab state. The Jews accepted that resolution. The Arabs rejected it. We ask the Palestinians to finally do what they have refused to do for 62 years: Say yes to a Jewish state. Just as we are asked to recognize a nation-state for the Palestinian people, the Palestinians must be asked to recognize the nation state of the Jewish people. The Jewish people are not foreign conquerors in the Land of Israel . This is the land of our forefathers. Inscribed on the walls outside this building is the great Biblical vision of peace: "Nation shall not lift up sword against nation. They shall learn war no more." These words were spoken by the Jewish prophet Isaiah 2,800 years ago as he walked in my country, in my city, in the hills of Judea and in the streets of Jerusalem . That is why a Palestinian state must be effectively demilitarized. We don't want another Gaza , another Iranian backed terror base abutting Jerusalem and perched on the hills a few kilometers from Tel Aviv. I believe such a peace can be achieved. But only if we roll back the forces of terror, led by Iran , that seek to destroy peace, eliminate Israel and overthrow the world order. The question facing the international community is whether it is prepared to confront those forces or accommodate them. I speak here today in the hope that Churchill's assessment of the "unteachability of mankind" is for once proven wrong. In the spirit of the timeless words spoken to Joshua over 3,000 years ago, let us be strong and of good courage. Let us confront this peril, secure our future and, God willing, forge an enduring peace for generations to come. " This is a major leap in x-ray imaging technology that just happens to make a trip to the dentist a little more endurable and eliminate the classic x-ray technology that we have had in place for a century. However, read the balance of this item. We are able to manufacture miniaturized devices almost at will with this capability. It is all about reducing often massive devices into vastly smaller devices and retaining capability. It sounds like a simple device can be placed in the mouth to produce a computer image of the teeth. Or at least we are about to get there. Dentists and their patients will soon benefit from a tiny new high-resolution X-ray camera. A Swedish company has adapted an advanced technique used for miniaturising space hardware to make a visit to the dentist a little more comfortable. The camera takes X-ray pictures that are dramatically more detailed and with higher contrast than the conventional X-ray machines widely used by dentists today. 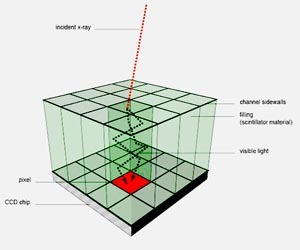 The heart of the camera is a tiny 'structured scintillator' device that converts X-rays to visible light. The camera was designed by the Scint-X company and the key element - the scintillator - was built by Swedish company Nanospace, drawing on their experience of producing space systems. In fact, the production technology has already been used by Nanospace to cut the world's smallest rocket motor out of silicon wafers. Another advantage is that the X-ray unit inserted into the patient's mouth is much thinner than today's models, making the procedure more comfortable. The breakthrough came when Scint-X produced the scintillator in the new structured silicon and asked Nanospace to build it in their high-precision 'micro-electro-mechanical system' (MEMS) facility. "The investment in our special machine [to produce MEMS] was entirely driven by the demand for capacity and quality in our production for space projects," says Tor-Arne Gronland, CEO of Nanospace. "Later, a number of non-space companies and research groups, such as Scint-X, have taken advantage of the processes and the capacity we now have." Nanospace used MEMS to build the miniature rocket motor flying on Prisma, a Swedish technology demonstration satellite launched in June 2010. Measuring only 51mm by 43.5mm, it is a complete micropropulsion system for precision control of a small satellite. Nanospace is working with ESA on the use of MEMS to provide miniaturised solutions for many of the fluid-handling components required in satellite propulsion systems. "ESA funded the research and development of the MEMS cold-gas thrusters that is now performing its first flight on Prisma," says Fabien Filhol from ESA's Product Assurance and Safety Department. "Now ESA is exploring with Nanospace the limits of this emerging MEMS-based micropropulsion technology for high-accuracy propulsion applications." Scint-X's innovative technology also has potential for use in space. The Swedish Space Corporation is planning to use the camera aboard a rocket planned to be launched in May 2011 by ESA. "Our camera provides a resolution that is better than five microns and will be used to study the melting and solidification of metals when producing exotic materials in weightlessness," explains Wiklund. "The synergy between space and non-space research and development, as in the case of Scint-X, illustrates the potential of technology transfer," explains Frank M. Salzgeber, Head of ESA's Technology Transfer Programme Office. "An advanced production technology set for space systems makes the development possible for a non-space orthodontic camera, which then can result in an innovative instrument for research in space." Will the Netherlands Rule High-Altitude Wind?